Actress Sonam Kapoor, daughter of the well-known Bollywood star Anil Kapoor is best known to us as the brand ambassador of L’Oreal. “Think right, eat right, be happy, content and feel beautiful from within as that is what reflects on your face” says our beauty diva. The unconditional love and support of her family and friends is the secret that makes her feel beautiful. Sonam never fails to follow her ritual of cleansing, toning and moisturizing every night. She gets her regular facials done by Dr. Richa Seth which does wonders for her skin. Sonam oils her hair twice a month with a mixture of sweet almond oil and coconut oil mixed with shikakai and follows it with a moisturizing mask which gives extraordinary smoothness to the hair. 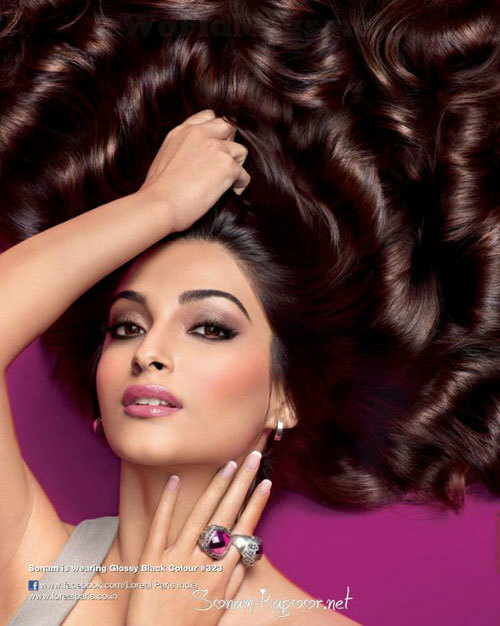 Sonam brushes her hair with a Conair hairbrush and uses Keratise hair products. She loves to colour her hair and makes sure that she conditions her hair well to maintain its health. Sonam never steps out into the sun without applying her sunscreen and avoids oil based heavy, chemical laden skin care products. She uses milk as an astringent and applies besan and curd face pack. Neutrogena sunscreen is one of her most used sunscreen. Sonam regularly sips coconut water every 2 to 3 hours which not only quenches her thirst but also keeps her skin in a great condition. True to her fashion conscious image, Sonam always keeps switching her makeup often and doesn’t stick to one particular look. Sonam is one of the most versatile actresses in terms of makeup and can easily adapt to any makeup look. Sonam’s love for makeup began at a tender age of 5 when she took her grandmother’s red lipstick and smeared it all over the face. 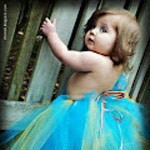 She would always be fascinated by things that made her mother and grandmother look beautiful. Her real tryst with makeup began at the age of 18 and kohl pencils have been a staple makeup product for her ever since. Sonam doesn’t really put much makeup during non-working days and just applies a lot of mascara and a lip gloss on the lips for a hint of colour. Sonam’s makeup essentials include L’Oreal Paris True Match which she finds extremely easy to use. 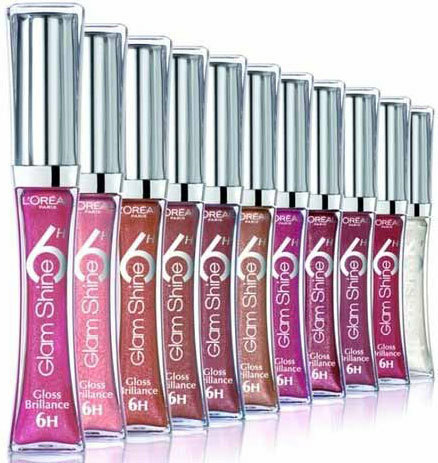 She is also fond of her L’Oreal Paris Glam Shine 6H lip gloss and L’Oreal Color Riche lipstick in Red passion. She always carries a sunscreen, MAC lip balm, Chanel and MAC cheek tints and La Mer’s Crème De La Mer face cream. Sonam’s coral pout and bold red lips never fail to delight us. She has a soft spot for her favourite matte red lipstick with yellow undertones which looks amazing on her. She wears this lipstick mostly during press meets and at times at night to jazz up her look. Sonam often keeps her lips toned down with peachy brown or a brownish pink lipstick when she wants her cute and elaborate hairstyle to shine. Sonam usually paints her eyelids dark and rocks the evening look with a smudgy dark look. She mostly wears shades of blue black, dark brown or a deep bottle green on her eyes. For blushes she mainly chooses dull pink, matte red or a subtle ash colour to complement her high cheek bones. Sonam never sticks to conventional nail colors like red, pink or coral and is often seen in trendsetting colours like black, brown, yellow or perky orange. Sonam took everyone by surprise with her drastic weight loss prior to joining the film industry. It was her mother’s support and a strong motivation to lose weight that helped her to get rid of excess weight. Her mother made sure her that her daughter kept her distance from all the fattening foods like chocolate, ice creams, fried foods and sweets. 1. Sonam followed a strict diet routine which comprised of six small low on carbs and high on protein meals. For breakfast she restricted herself to oatmeal and fruits. 2. Post workout she used to have brown bread with egg whites, followed by a protein shake and juice. 3. Her lunch comprised of dal, sabzi, ragi roti, salad and a piece of chicken or fish. 4. For evening snacks she would have high fiber foods like crackers with chicken, cold cuts or egg whites. To maintain a healthy skin and to flush out all the toxins, Sonam drinks a glass of lukewarm water with honey and lime juice daily. Following the footsteps of many Hollywood actressese, Sonam has adopted the policy of not having any thing late at night to give her time to burn the calories. Sonam said “I have about five to six meals in a day. For breakfast I have three egg whites and a bowl of porridge. For lunch I have brown rice, chicken, dal, vegetables and dahi. For dinner I have chicken, eggs or fish with a bowl of vegetables and one chapatti. I snake on crackers and fruits throughout the day as well”. Even after a following a healthy diet, Sonam just cannot get enough of chocolates. Sonam became well known for her stunning weight loss preceding her debut film “Saawariya”. Sonam’s fitness trainer is Zarine Watson and she hits the gym whenever she gets time. 1. 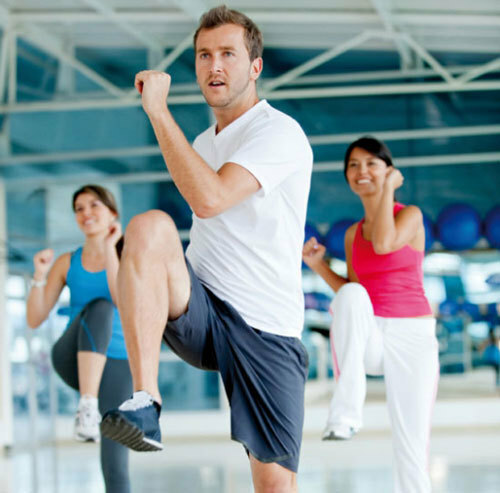 I feel cardiovascular exercises work best for me in combination with weight training. 2. Each day of the week I focus on a particular body part, such as the abdomen, arms, shoulders or waist. I do 30 minutes of cardio every day. 4. I practice Bharat Thakur Power Yoga. 6. I do Pilates at least 3 times a week. The above information has been gleaned for your reference from several interviews Sonam Kapoor gave to media channels.